Radius Report: A monthly perspective on best practices. Business leaders across all industries are seeking ways to capture more realistic customer behaviors and reactions. Based on our experience with leading brands, we believe Virtual Reality (VR) is able to achieve more authentic perspectives on key business issues (relative to other digital collection methodologies). VR is often brought into the research methodology when the desire is to capture more “in-the-moment” experiences. While the concept of VR is not new, the quality of the experience and the ability to apply it more readily has improved dramatically. Marketing and product teams can bring customers into a fully immersive and interactive environment more easily than ever. This allows these teams to learn how customers interact with floor plans, displays, shelves, packages, and anything else we place within a virtual world. And it does so in a way this is logistically more practical than other alternatives. For several of our clients, this has meant creating customized environments, 3D packages, and other stimuli to test unique variables and observe how customers respond. Our qualitative specialists are there to ensure key learning objectives are achieved. Environment Engagement: Customers are immersed in a virtual environment and behave as they normally would in the real world by shopping the store as well as the shelf. Purchase Behaviors: Customers make purchase choices based on the stimuli outlined above. 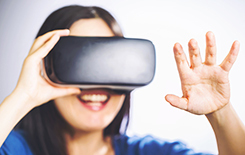 Want to learn more about how VR can address your business issues? Contact us.